Visions of Jesus Christ.com - Maria von Mörl - Stigmatist. Popular mystic known for her prolonged ecstasies, which would often last for hours while she remained kneeling. In the beginning of 1868, a remarkable human life came to a close. An extraordinary soul whose name and fame travelled from South Tyrol (Italy) all over Western Europe, which caused her home to become a frequented pilgrimage place for countless souls, which of course was very much against her will and liking. But, so it was for the great consolation of multitudes who came to visit her during an entire generation, and who were inspired and edified by her heroic life and virtues. Maria von Morl (also spelled von Moerl), was born Maria Theresa von Morl on October 16th, 1812 [some biographies list her birth as the day before, that is October 15th -ed.] She was the daughter of a vine cultivator named Joseph Ignaz and Maria Katharina (Sölva) von Morl in Kaltern, Germany (now known as Caldaro, Italy as at that time this part of Italy was owned by Germany -editor). In 1827, her beloved mother was taken from her by death; Maria’s mother had bore a child almost every year; she died in childbirth with the 11th child. Maria was then 15 years old and was left in sole charge of the family, her father leaving her in charge of her eight younger sisters. Maria undertook her new role as mother as best she could, seeking more than ever consolation in prayer in her increasing labors and responsibilities, and in the frequent reception of the sacrament of the altar. Some biographers state that her father was neglectful towards the children, most notably especially after the death of the mother. They also state that her father was an alcoholic, and would allegedly beat her on occasion. Eventually the burden became too heavy for her young shoulders and frail health, and she sank under it. In her eighteenth year she fell into a wearisome sickness, and most notably violent cramps, which broke down her constitution. Only by slow degrees was her pain alleviated and her health somewhat restored, although she never completely recovered from this illness. 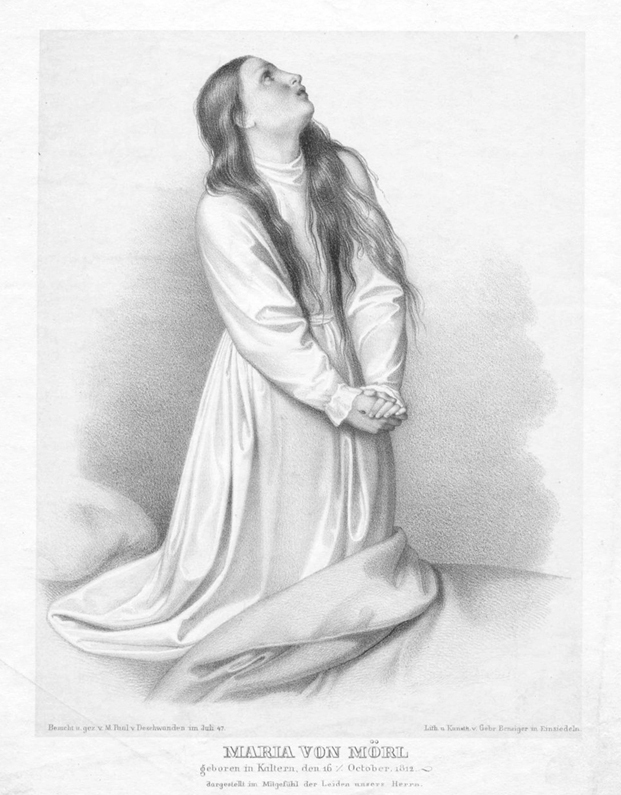 Yet she bore all her afflictions with heroic resignation, but it was also noted that in addition to her physical torments, she seemed to be undergoing certain spiritual struggles, which were certainly the beginnings of the temptations of the devil in an effort to lead her astray from the path that God was leading her. Such was her condition for about two years, when her confessor, Father Capistran, a quiet, prudent man, and for years a true friend of the distressed family, stated "..that at certain times, when she was interrogated by him, she did not answer, and seemed to be out of herself." When he questioned her nurses and others on this point, they informed him that such was always the case when she received holy Communion. This was the known beginnings of her ecstatic state, into which she entered in her twentieth year, and which soon became more and more striking. On the feast of Corpus Christi, 1832, which in Kaltern (Caldaro), as throughout the whole Tyrol, is celebrated with unusual solemnity, Father Capistran, for special reasons, gave her the holy sacrament at 3:00a.m., and immediately she fell into an ecstasy which lasted, for several hours until he left her to attend to other duties; and when he returned, at noon on the following day, he found the ecstatic still kneeling in the same place where he had left her thirty-six hours before ; and heard, to his astonishment, that she had remained the whole time thus undisturbed in contemplation. The good Franciscan now realized that God was granting her extraordinary graces, but for what purpose he did not know as of yet. A grace of foreknowledge in certain circumstances was given to her along with her ecstasies, as several presentiments and prophecies came true in a most surprising manner. Much to her disquiet and dismay her fame was soon spread abroad. The report of her ecstatic kneeling and prayer spread through the Tyrol, and great excitement was created throughout the whole land. Crowds of people flocked to see her, and to be edified by the sight of the holy girl. From different and distant places numbers came as pilgrims to Kaltern. During the summer of 1833, more than forty thousand persons, of all classes, visited her and sometimes several hundred people in a single day. No one could explain the sudden and extraordinary commotion excited in a whole people. The civil and ecclesiastical authorities wished to prevent the concourse; so it was announced that no further pilgrimages would be allowed. They gradually ceased. The priests, however, bore testimony to the good results which had flowed from the pilgrimages. In the autumn of the same year, Francis Xavier Luschin, Prince-Bishop of Trent, caused an investigation to be made, and the witnesses to be examined on oath, regarding the state of the ecstatic virgin, to prevent any further proceedings and annoyances on the part of the police, but especially to remove all suspicion of pious fraud. The prince-bishop, who was impartial enough not to give a final decision, informed the civil authorities "…that the sickness of Maria von Morl was certainly not holiness, but also that her irrefutable piety could not be called a sickness." She managed, through the grace of God, to keep humble and devout amidst all this excitement and she seemed to remain mostly undisturbed by the throngs who came to see her. Her inner life and interior reform seemed to be continually growing and developing in the year 1834, when on one extraordinary day she received the stigmata. How this happened is best told in the words of her first biographer, Johann Joseph von Gorres, who visited Maria and devoted 30 pages to her in his book “Über christliche Mystik” (Concerning Christian Mysticism): "In the fall of 1833, the father-confessor occasionally remarked that the center of her hands, where the wounds appeared at a later date, began to become painful and troubled with frequent cramps. He suspected that stigmatigation was about to happen, and the result justified his expectations. At early Mass, on February 4th, 1834, he found her wiping her hands with a cloth in childish astonishment. When he perceived blood on it, he asked her what was the matter. She answered that she did not understand what it was; that she must have cut herself in some strange way. In fact however it was the stigmata, which from that day remained unchangeably in her palms, and soon appeared in her feet also, as well as in her side. So simply did Father Capistran act in the whole affair, and so little desirous of wonderseeking did he show himself, that he never asked her what were her interior dispositions or phenomena immediately before the reception of the wounds. He knew how important it was for her to remain humble and discreet." "The stigmata were almost round, slightly oblong, about two inches in diameter, and appearing on both the upper and under parts of her hands and feet The size of the lance stigma in the side, which only her most intimate female friends saw, could not be determined. On Thursday evenings and on Fridays, clear blood flowed in drops from the wounds; on the other days of the week, a dry crust of blood covered them, without the slightest symptoms of inflammation or the slightest traces of pus or infection ever appearing. She concealed most carefully her state, and all that might betray her interior emotions. However, on the occasion of a festive procession, in 1833, she fell into an ecstasy in the presence of several witnesses. She appeared like an angel, blooming like a rose. Her feet scarcely touching the bed, she stood up, with arms outstretched in the shape of a cross, and the stigmata in her palms manifest to the surprised beholders." Although Maria von Morl remained a layperson all her life, she followed the example of her spiritual director and confessor, the Franciscan Father Capistran, and became a lay-sister of the Third Order of St. Francis, and, in virtue of the obedience due to him, her confessor undertook to keep her ecstasies and the expression of other mystical graces within due bounds and limits. She promised him complete obedience. A word from him recalled her to herself. However, his experience in the mystical life and mystical spirituality was limited, which in some ways was a good thing, as he was very simple and not at all inquisitive. Father Capistran did not interfere in her extraordinary spiritual life, nor did he even try to investigate her interior life with curiosity, which in turn helped to keep her humble, which is very important for all souls, especially mystics. "If she is not questioned," wrote the good and simple confessor to her first biographer Gorres, "she says very little, and seldom speaks at all; thus, for instance, it is only today that I learned completely her vision of St. Paul—-on the feast of his conversion. Only now and then does she relate a particular circumstance, which I listen to quietly; and if she says nothing, I do not trouble her with questions. She sometimes says to me, 'I cannot properly express what I see by word of mouth or by writing; and perhaps I might say something false.' My direction towards her is extremely plain: I want her to be always humble and devout to God; and I am satisfied when she prays fervently to God, and intercedes for others--for sinners as well as for the just. It always seems to me that it is not the will of God that I should inquire too curiously about her visions and revelations, as Brentano did with Emmerich." Thus wrote Father Capistran, who describes himself in his letter better than we could possibly do it. But her life here on earth was fading. She had a presentiment of her death before it took place, and prophesied often that she would never pass the winter on earth. Toward All Saints day her weakness became greater, and everything foretold her passing. She could no longer bear nourishment. Lemonade or water, with the essence of quinces, was almost her only nourishment for some weeks before her death. When she felt better on certain days, she ate fruit, bread, or porridge, but never meat or meat soup. She sometimes spent several days without eating or drinking. In the last week, especially from Wednesday, she suffered great torture. But she was full of resignation; indifferent to life or death, she never complained. She was patient and full of calm resignation and child-like love. On the feast of the Epiphany, five days before her death, she showed herself in her usual way to the pilgrims; there was a mission at Kaltern, and the missionaries visited her on that festival, to bid her farewell. She received them with her usual cheerfulness, and offered them grapes to eat. She knew nothing exact about the precise moment of her death, but only that she should die when everything on her became white. The stigmata began gradually to disappear, leaving only a blue spot, which disappeared entirely after her departure. She received the holy Viaticum on January 6th, in the evening. Every one thought she would die immediately; but she made known by gestures that she should not die yet. She remained conscious, and was able to receive holy Communion daily. At last the day of her flight for heaven came. About half-past two on Saturday morning, January 11, 1868, two hours after receiving Jesus in holy Communion, she passed from this vale of tears to her heavenly home. She did not experience a final agony, but was serene and calm. She lay quiet, occasionally murmuring the name of Jesus; and one of the bystanders heard her say: "Oh! how beautiful; oh! how beautiful." Her breathing grew weaker, and she fell gently asleep in death. Her body was exposed in the church for two days, and thousands visited it. Many felt as if they had lost a member of their own family, so dear that she was to them. She lay dressed as a bride, clothed in white, with a white veil on her brow, and a crown of flowers at her feet. Her face was beautiful to look upon, half-childlike in expression, yet mingled with the dignity of a matron; her head reclined, bent toward the left side; her brow and eyes were full of dignity; her mouth like that of an infant smiling in sleep; her hands white as alabaster, and ruddy as roses. Afterward the veil was taken away and she appeared more angelic than ever, her rich flowing hair surrounding her noble head. A look of perfect happiness beamed from her entire countenance. Her burial was solemn. Surrounded by mourning and edified multitudes, her body was borne by young maidens from the catafalque to the zinc coffin prepared for its reception. Her remains were taken on January I3th to her father's family vault at Kaltern, where they now rest in peace. Kaltern lost a jewel in losing Maria; but her virtues will live for ever in the hallowed spot where she was born, lived and died. Truly did Gorres write of her to the Prince-Bishop of Trent: "God put her like a living crucifix on the crossroads, to preach to a godless and dissipated people." She was one of those lamps lighted by the hand of God Himself to shine in the darkness, when infidelity is everywhere robbing and devouring in the vineyard of Christ. She was sent by God to assist in the conversion of sinners, and surely we may well assume that the graces she obtained through her extraordinary sacrificial life in union with Jesus will not cease with her death.